Oh man, English problems cause genders of nouns are all equal - no. 1: it = something; no. 2 it = love (love isn't considered to be a "thing"). Capisci? 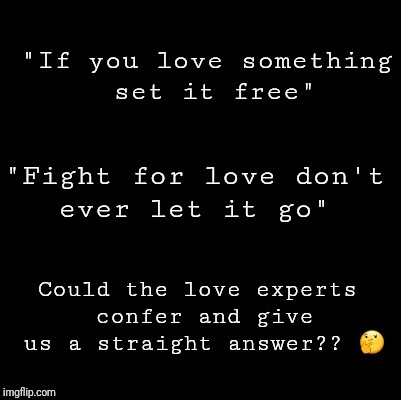 I would agree except for the fact that IT (Love that you wrongly refer to as to what is being set free) is not what is being set free rather that which IS the object (IT) of Love that is being set free. I.E a person or possesion of somekind. Capisci?? Also before you go and correct someone make sure you create a coherent sentence or statement. Did you lose your speech? Sorry, typical typo *because. I repeat. No. 1: If you love something set "this something" free. (e.g if you love your pet, (or even a person) set it free). To give freedom to something or someone you love is the greatest sign of love you can give. No. 2 Fight for love, don't ever let the love go. And if you once have found this true love that is able ot setting other things free, fight for it, don't let it be taken from you by adverse circumstances.